Available year-round for only $.30/lb., cabbage can be both an easy side dish and a frugal side dish. 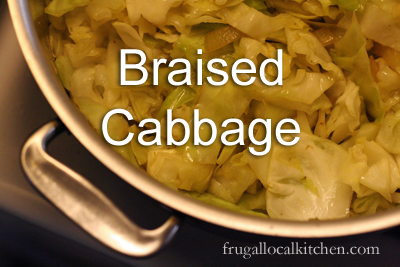 Ridiculously easy to prep, cabbage stores well in my fridge for up to a month at a time. Usually, it’s gone in 2 weeks at the most in my home. Out of desperation for something gluten-free to eat this week, I came across a recipe for braised cabbage and adapted it to my own tastes. Even if you add in sliced carrots or leeks, this would still be a relatively frugal dish. After making this, I had it another day for lunch and put sauteed kale, onion, and mushrooms over top. Yum! You can use fresh cabbage for this recipe or frozen. It’s easy to grow cabbage in the garden (just keep an eye on the insects), and freeze the cabbage for the winter. If you grow red cabbage, they add a nice touch of color to the landscape. I like to use my homemade chicken stock; you can find organic chicken stock in the store if you don’t have any on hand. Saute the onion in bacon grease until soft. Then, add the cabbage and continue sauteing for about 5 minutes until the cabbage is soft. Add about ½ cup of chicken stock to the pan and cook the cabbage on medium-low heat for 20 to 30 minutes. 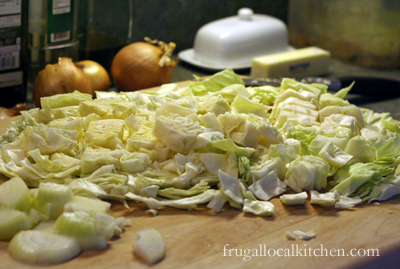 Add more stock as the cabbage cooks down to prevent sticking. When the cabbage is very soft, remove from heat and mix in lemon juice, salt, and pepper. Serve immediately. One of my absolute favourites. Not many people seem to like cabbage, but I think they are just rediculous. Will try this out. Thank you for reminding us of this simple way to prepare cabbage, and for incorporating bacon. I will surely make this some hurried evening using the bacon drippings I save in the freezer but often forget to use!